The midfielder tallied 51 per cent of a vote on this website to clinch the accolade after a month in which the Reds beat Arsenal and Burnley and claimed a draw at Manchester City. Adam Lallana finished as runner-up with 13 per cent of the final total, while Emre Can and Sadio Mane were joint-third (nine per cent). 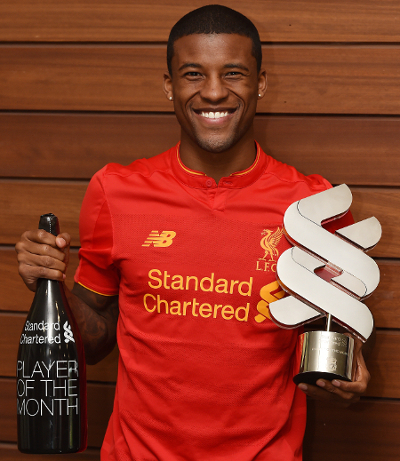 It’s the second time Wijnaldum was awarded the trophy this campaign, having also scooped it for January – but he acknowledged this felt all the sweeter due to Liverpool’s improved form. The No.5 told Liverpoolfc.com: “It feels great, even better than the first time I won it because the first time we were not in a good situation – we were not winning games at the time, so this one feels much better! It’s always a good feeling to win the Player of the Month award. “I hope [we’re seeing Liverpool get back to their best] because there’ve been times when we’ve had a good result in a big game, but then lost the next one. Wijnaldum started all three matches for Liverpool in March, scoring crucial goals in the victories against Arsenal and Burnley at Anfield. He added: “I am really pleased with my form, but also because we’re winning games and the whole team are playing well.